binding to a toxin molecule (e.g., diphtheria or tetanus toxin) thus keeping the toxin from entering a cell where it does its dirty work. But most of the time, the binding of antibodies to antigen performs no useful function until and unless it can activate an effector mechanism. The complement system serves several effector roles. the interaction of antibodies and antigen provides the specificity of the response. Put another way, antibodies "finger" the target, complement destroys it. The complement system consists of some 30 proteins circulating in blood plasma. converts them into a protease. Thus many components of the system serve as the substrate of a prior component and then as an enzyme to activate a subsequent component. This pattern of sequential activation produces an expanding cascade of activity (reminiscent of the operation of the blood clotting system [Link]). The binding of antibody to its antigen often triggers the complement system through the so-called classical pathway. It can occur in solution or — as shown here — when the antibodies have bound to antigens on a cell surface. The constant regions of mu chains (IgM) and some gamma chains (IgG) contain a binding site for C1q. A single molecule of IgM is enough to initiate the pathway. IgG is far less efficient, requiring several molecules to do so (6 is the optimum — the same as the number of C1q molecules in C1). Binding of C1q activates C1s and C1r. C3 is the most abundant protein of the complement system (~1.3 mg/ml). Because of its abundance and its ability to activate itself (by a mechanism described below), it greatly magnifies the response. 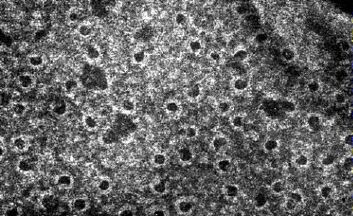 C3b, which binds covalently to glycoproteins scattered across the cell surface. Macrophages and neutrophils have receptors for C3b and can bind the C3b-coated cell or particle preparatory to phagocytosis. This effect qualifies C3b as an opsonin. As Dr. Ridgeon says in George Bernard Shaw's play The Doctor's Dilemma, "Opsonin is what you butter the disease germs with to make your white blood corpuscles eat them." C3a This small fragment is released into the surrounding fluids. It can bind to receptors on basophils and mast cells triggering them to release their vasoactive contents (e.g., histamine). Because of the role of these materials in anaphylaxis, C3a is called an anaphylatoxin. The resulting complex C5b•6•7•8 guides the polymerization of as many as 18 molecules of C9 into a tube inserted into the lipid bilayer of the plasma membrane. This tube forms a channel allowing the passage of ions and small molecules. Water enters the cell by osmosis and the cell lyses. Cell lysis is only one function (and probably not the most important one) of the complement system. The complement system acts in several ways to mobilize defense mechanisms. Opsonization by C3b targets foreign particles for phagocytosis. Chemotaxis by C5a attracts phagocytic cells to the site of damage. This is aided by the increased permeability of the capillary beds mediated by C3a and C5a. The early complement components are also important for solubilizing antigen-antibody complexes assisting in their catabolism and elimination from the body. Failure of this function can lead to immune complex disorders. The complement system can also be triggered without antigen-antibody complexes. Even in their absence, there is a spontaneous conversion of C3 to C3b. Ordinarily the C3b is quickly inactivated: the C3b binds to inhibitory proteins and sialic acid present on the surface of the body's own cells, and the process is aborted. binds a protein called Factor B forming a complex of C3b•Bb. C3b•Bb•C3b, which is a C5 convertase and can start the assembly of the membrane attack complex. more C3b! This second function (shown here) creates a positive feedback loop, amplifying what might have started as a small reaction (the formation of C3b by either or both the classical and alternative pathways) into a massive production of C3b. Factor H removes Bb from the alternative pathway C3 convertase breaking the positive feedback loop. C1 inhibitor (C1INH) binds to sites on activated C1r and C1s shutting down their proteolytic activity. So when C1 is activated by antigen-antibody complexes, there is only a brief interval during which it can cleave C4 and C2 before it is deactivated by C1INH. C3. An inherited deficiency of C3 predisposes the person to frequent bouts of bacterial infections. C2. Curiously, immune complex disorders, not bacterial infections, are the main problem with a deficiency of C2 (or of one of the other "early" components like C1q, C1r, C1s, or C4). This emphasizes the important role of the complement system in clearing away antigen-antibody complexes. C1q. A deficiency of C1q is frequently found in patients with the autoimmune disorder systemic lupus erythematosus (SLE). C9. Another curiosity: most people who cannot make C9 have no more of a problem with bacterial infections than those who can. Laboratory studies suggest that the C5b•6•7•8 complex by itself is able to lyze bacteria although not as efficiently as C9. And, in fact, a deficiency of C8 is associated with a sharply-increased risk of bacterial meningitis.